If you saw me on Twitter yesterday you saw that it was the day of tests for me..the CSET for Preliminary Technology (that was a fun two+ hours of writing along with mind-numbing multiple choice questions) and three online quizzes for my Teaching the Exceptional Individual online class I am taking now. This class is moving along so quickly - seems impossible that I'm already a 1/3 of the way through. All of the studying has kept me away from blog reading and blog posting but that will be remedied once my boys go back to school - tomorrow. Before I jump into the episode notes let me show you my first sewing finish for 2012 - the Quatrefoil (meaning: four leaves) block for the Modern Blocks Bee for January 2012. 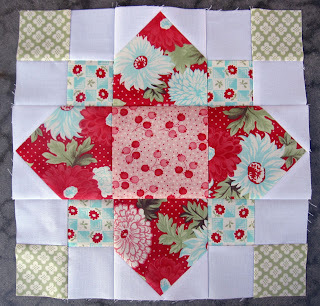 I just love this block and although spooked when I first cut into Alisha's fabric that she sent me (did not want to mess up), I pushed through and was happy with my result. It's my very first Bee block! Modern Blocks Bee - Quatrefoil 12"x 12"
In Episode 19 I talked about Bargello Quilts with my inspiration for the episode coming from Katie of Katie's Quilting Corner. 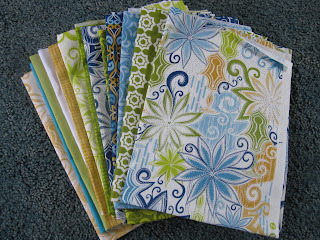 She is currently hosting a Bargello Placemat/Tablerunner Quilt Along on her blog which I will be participating in soon. 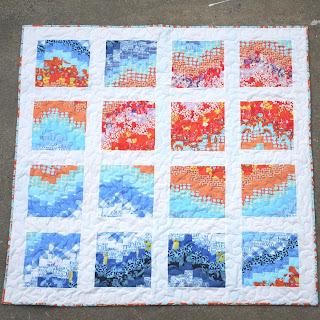 Katie has been posting a few photos up on Twitter this past week of her prototype Bargello Table Runner and it caught my eye for its flowing “wave” design. I was curious about both how the design is created and where the original design originated from so I went searching and what I found surprised me. I'll start with the original needlework that possibly began in Florence, Italy (with Hungarian influences) and then was brought to other parts of Europe through trade and travel. Walls are decorated with a flame stitch textile. 17th Century. 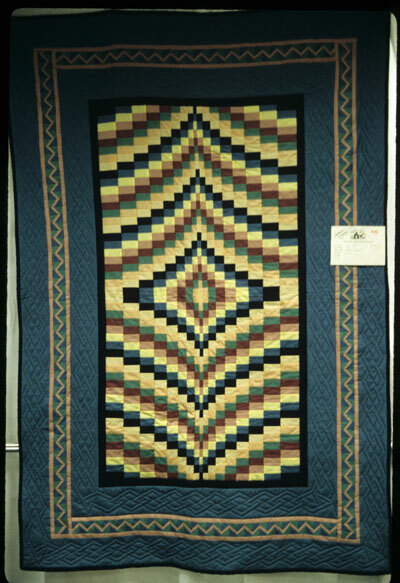 Next is a classic Bargello style quilt from 1994 which brings the Bargello needlework design to fabric. Lindahl, Signe. Bargello. 1994. 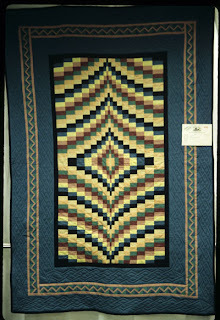 From Michigan State University Museum, Michigan Quilt Project. A very modern Bargello - and gorgeous. Please visit Briana's blog at http://briana-arlene.blogspot.com/. Lastly, I am participating in the Sew Happy Geek Quilt Along hosted by Jenna that began last week. Thank you to Julie from The Intrepid Thread for helping me choose these wonderful fabrics for the Quilt Along. Alright that's it for me today. Your modern blocks bee block (what?) is just lovely. I really like the colors you used. oooo - glad to see a podcast is up - will go listen shortly!! And congrats on the bee block - it looks fantastic! Sooo glad we are in the bee together! ;-) Love your new qa fabric! 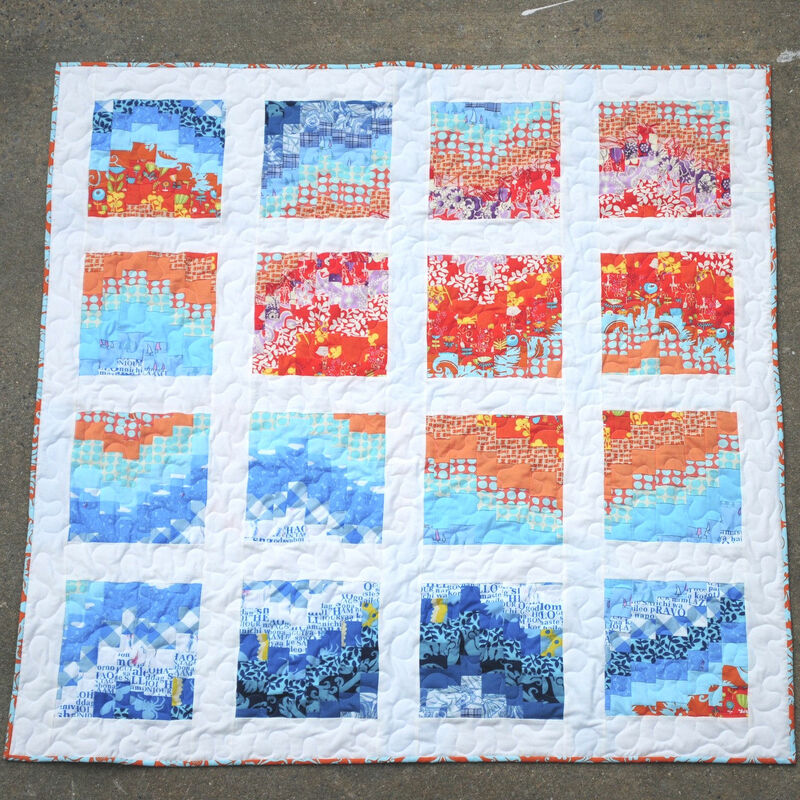 I love the fabrics you chose for the Bargello QAL & thanks for the "Very Modern Bargello" link- that quilt is great! Yea - a new podcast! I am so impressed you and your family go to the Parade each year. I haven't been, except to drop kids off when my kids were teens, since I was a teen. I lived in the SLO area in college and I think I left part of my heart there. I am not sure I have ever been anywhere with the SLP air, vibe, and ambience. I loved it. Next time I go to Asilomar I will stop in Paso. I didn't know about the quilt shop you mentioned. Thanks! Lovely block. I enjoyed the podcast; I can hear that you're relaxing more in front of the microphone. Enjoyed #19! Interesting about bargello - to think I was in Florence and had no idea! 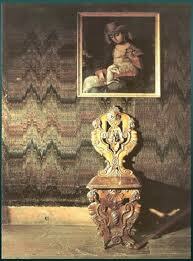 ;-( I did needlepoint a bargello pillow years ago, but it's long gone...too bad. And I think your pouch + giftcard was a great idea - I copied it for one family member, and I think it was appreciated. Yesterday I whipped up another pouch as an added gift for a friend - I think she had no idea I'd made it, sigh. Anyway, I enjoyed your podcast while working away in my sewing room!